Start this process in late fall since the lighting changes at that time. Make sure to hang the lamp or bulb up in the coop where the chickens can’t snuggle up to the lamp and cinge there feathers. 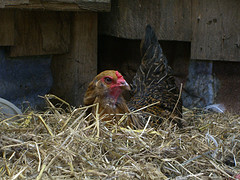 Make sure the light reaches the whole coop and offers heat throughout. This entry was posted on Monday, November 3rd, 2014 at 12:22 pm	and is filed under News & Updates. You can follow any responses to this entry through the RSS 2.0 feed. Both comments and pings are currently closed.